Moonbase Alpha is a FREE, NASA-funded, computer game set on a hypothetical lunar outpost. A wayward asteroid hits and knocks out critical life-support systems. The player (or group of 2-6 players) has to analyze the situation and restore the systems before emergency supplies are exhausted. To do so, the astronaut must use a variety of tools including a remote-controlled robot. During a recent visit, grandson Joshua (he starts the fourth grade this year) played through Moonbase Alpha in about 45 minutes. 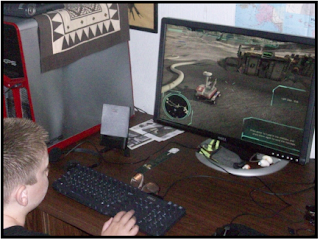 After a brief time experimenting with the mouse and keyboard controls, Joshua went on to successfully play through the game to the end. He then challenged me to better his time! 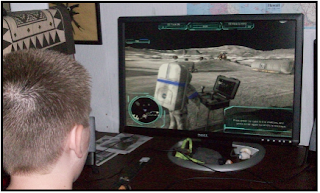 In the following picture, Joshua is controlling the astronaut as the astronaut sets up a repair station. In this photo, Joshua, from the perspective of the controlling astronaut, sends a repair robot into an area too dangerous for the astronaut to enter to replace a damaged life support system component. As adults, we can help kids by understanding that even though we may feel uncomfortable playing a video game, our kids do not. Why not put quality gaming experiences in our kid's environment and simply out of the way. By the way, I have not bettered Joshua's time. Yet. 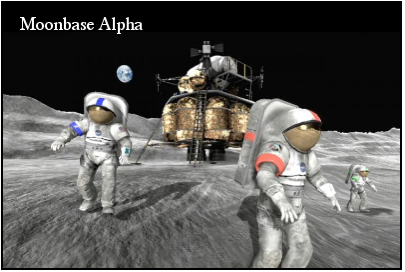 Here's the link to the NASA web site where you can learn more about Moonbase Alpha. The site will also direct you to the Steam home page where you can search on Moonbase Alpha and download the game (PC only). If you don't already have the free Steam client software, you will have to download and install it before Steam will download the game to your computer. I know this is an old post, but I just found it through a Google search and wanted to comment. I am the project manager for Moonbase Alpha. Your account of experiencing the game with Joshua brought a smile to my face. From my desk I see total download numbers and requests for tech support, but I seldom read a first hand accounts involving young players. I appreciate the window into your time together.